As the newest hair extension type on the market, tape in hair extensions are already becoming the most popular choice. There are many reasons to choose it over other methods, and despite the premium quality they still remain a low cost alternative. Users that are new to tape in hair extensions will learn to appreciate the many benefits it offers over standard extension types. Are Tape In Hair Extensions Safe? Yes! They bond to all types of hair without the use of chemicals or tools. That is why they are the biggest trend in the industry and the most requested hair extension type. Since it is a 100% natural method for application, there are no worries about allergic reactions to glues or chemicals. Tape in hair extensions also lack the damaging qualities of harsher methods. Users with thin hair can protect their ends while gaining an impressive length with the application of tape in hair extensions. The extensions are quick to add, and even quicker to remove. Just a small amount of the medical adhesive tape is enough to keep them in place until removal. 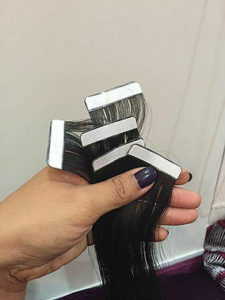 High quality tape in hair extensions can last up to seven weeks before they have to be taken out. When you’re ready to take out the extensions, removal spray is used to weaken the bond so that you don’t suffer hair breakage. In the hands of a professional, you’ll have no issues with tape in hair extensions. Who Can Use Tape In Hair Extensions? Anyone that wants to rock a good look can use tape hair extensions! Big time celebrities like the Kardashians swear by tape in hair extensions. Even YouTube celebrities like Jenna Marbles has filmed herself receiving the treatment. It also isn’t uncommon for the Queen Bae to put in extensions as a natural way to protect her hair during long tours. There are plenty of other benefits along with a lot of frequently asked questions available at www.keshhair.com Russian standard tape in hair extensions are the real deal! 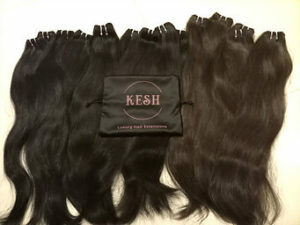 How to choose non damaging hair extensions- by Kesh Hair What kind of hair extensions should I buy??? ?